Everyone asks me on a regular basis, “Calah, what are people looking at when they view my home? What do I need to do to make my home stand out during showings?” My response is always the same, “What do YOU look at when you’re looking for a new house?” Everybody looks at the same things. “Is it clean?” “Does it POP?” “Does is stand out?” “Does it feel like home?” These are the things that people always think about. Nobody wants the same house as the neighbor, nobody wants to buy someone else’s problem, and no one wants “just a place to sleep at night.” These are the things we talk about daily. So, what should you do to make YOUR home stand above the others, without breaking the budget? There are tons of ways to do things YOURSELF to make your home show ready! First, cleaning is FREE! Get some soap, water, and a rag and get to work! Baseboards, windows, blinds, inside the appliances, tubs, showers, and bathrooms. When you think you’re done cleaning, clean one more time just to be safe! Second, pressure wash the outside, siding and trim; this is also a great time to make sure you don’t have any rotten wood or defferred maintenance items hanging around. Third, any of those items you notice, fix them! Rotten wood, saggy gutters, blown out bulbs, etc. Do what you can and get friends to help! (A case of beer and burger goes a long way with handy friends! And they don’t mind helping! Most of the time!) Also, pinestraw is not supposed to be gray. Add a few bales or rolls of pinestraw and fluff those beds! Next, add some color! It’s springtime, get some geraniums and some ferns, get a couple cheap colorful pots, add a cute door hanger, and CUT YOUR GRASS! Also, if your house is a little dark, change your lightbulbs to LED bulbs! This goes a long way to brightening up a room without breaking the bank! Add some pictures, cute throw pillows, and good smelling plug in or candle and you’re done! 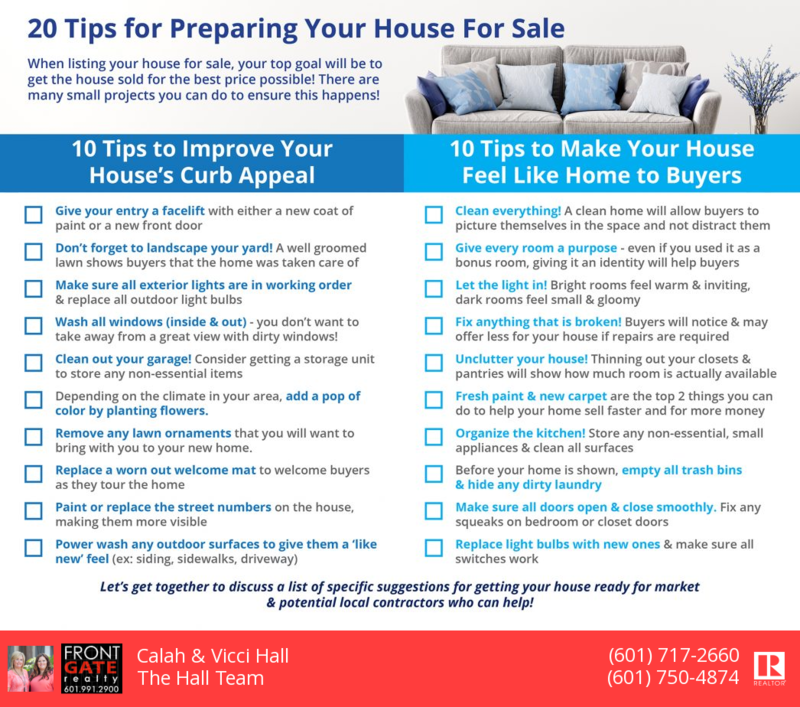 And, FINALLY, the most important thing to do when getting your home ready to list… are you ready for it? CALL US!! We are happy to come by and give a market update at any time and tell you if there is anything major that needs to be done! And as always, keep us in mind for all your real estate needs!